Quick question - do PPL exam marks (not just pass/fail) get recorded anywhere permanently? And if you repeat the same exam (to score a better grade) is this noted anywhere? Quick question - do PPL exam marks (not just pass/fail) get recorded anywhere permanently? 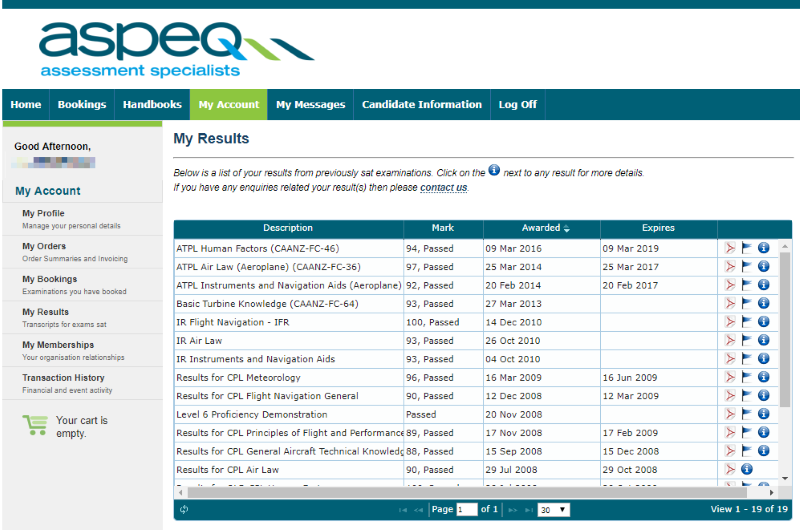 You need to create an account to be able to book exams and an entire transcript of all your exam results is available on there (entire history, it even shows my PPL results from "paper exams" conducted in 1999 and 2003 before the computer based system existed!. ). You can download the result notification in PDF format etc. I've never failed nor repeated an exam as yet (although there are 3 ATPLs that I'll be resitting soon as they have expired ), so I can't comment as to whether it shows all results, or only the most recent for any given exam, but I suspect that it will show all exams sat and their results. And if you repeat the same exam (to score a better grade) is this noted anywhere?